On a recent pilgrimage to Rome, members of the Sodality of the Blessed Virgin Mary and Saint Patrick took the short trip southwards to Nettuno, the site of the martyrdom and the shrine of St. Maria Goretti, illustrious member and heavenly Patroness of the Sodality of Our Lady. The story of the life and death of the 'Lily of Corinaldo' are well known. 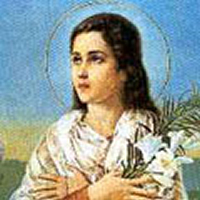 In 1902, she died a martyr of the virtue of purity and on her deathbed, the site of which was visited by the Sodalists and reverenced by them, she made two conscious acts, the first was to forgive her murderer, the second was to request that she be received into the Sodality of Our Lady. Her request was fulfilled and she was presented with the Sodality Medal on the traditional 'virgin blue' ribbon. She kissed the medal, with its representation of Our Lady of Grace, often in her last moments. When her exceptional holiness came to be more formally recognised and her body was exhumed twenty-seven years later, medal and ribbon were found to be in perfect condition, without the slightest trace of corruption. She was canonized in 1950. She is among more than 80 Sodalsts who have been canonized, including Ss. Mary Ann Paredes, Marguerite Bourgeoys, Julie Billart, Madeline Sophie Barat, Vincenza Gerosa, Bartholomea Capitanio, Mary Mazzarello, Bernadette Soubirous, Frances Xavier Cabrini, and Thérèse of Lisieux.